In 1926 Agnes Hunt became Dame Agnes Hunt when she was awarded Dame Commander of the Order of the British Empire (DBE) in the Birthday Honours. 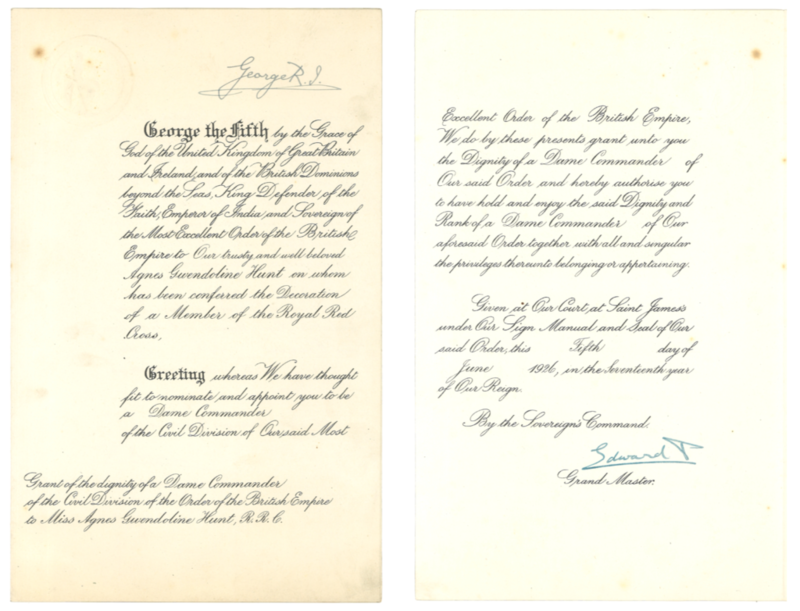 “George the fifth by the Grace of God of the United Kingdom of Great Britain and Ireland and of the British Dominions beyond the Seas, King Defender of the Faith, Emperor of India and Sovereign of the Most Excellent Order of the British Empire to Our trusty and well beloved Agnes Gwendoline Hunt on whom has been conferred the Decoration of a Member of the Royal Red Cross. Greeting whereas We have thought fit to nominate and appoint you to be a Dame Commander of the Civil Division of Our said Most Excellent Order of the British Empire, We do by these presents grant unto you the Dignity of a Dame Commander of Our said Order and hereby authorise you to have hold and enjoy the said Dignity and Rank of a Dame Commander of Our aforesaid Order together with all and singular the privileges thereunto belonging or appertaining. Given at Our Court at Saint James’s under Our Sign Manual and Seal of Our said Order, this Fifth day of June 1926, in the Seventeeth year of Our Reign.